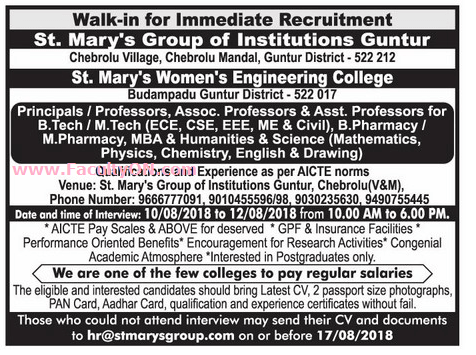 St.Mary Group of Institutions, Guntur has advertised in the EENADU newspaper for the recruitment of Professor / Associate Professor / Assistant Professor / Principal jobs vacancies. Interested and eligible job aspirants are requested to walk-in on 10th, 11th and 12th August 2018. Check out further more details below. About College: St. Mary College of Engineering and Technology (SMCET) is a technical institute located in Deshmukhi, Hyderabad, India. The college is affiliated with Jawaharlal Nehru Technological University, Hyderabad.The college was established in 1996, with three undergraduate programmes and an intake of 180 students. By 2007 it had grown to four undergraduate courses with seven sections and four postgraduate courses with a total intake of 681 students.